The abdomen, commonly called the stomach, is the part of the trunk situated between the thorax and the pelvis. 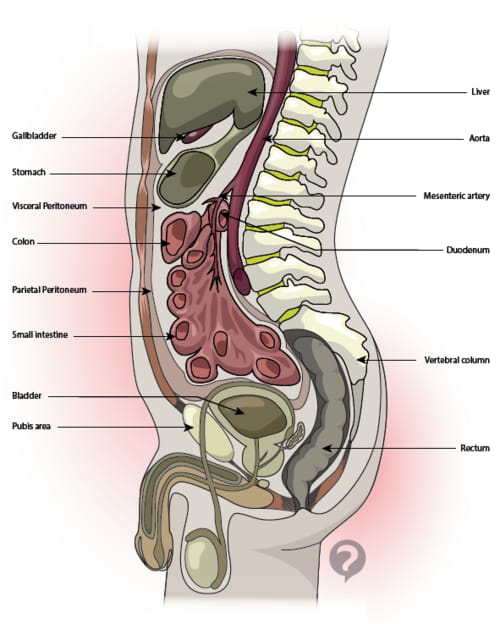 It is made up of numerous abdominal muscles, the digestive system surrounded by the peritoneum, the urinary tract with the kidneys, the bladder, the ureters, the masculine or feminine genital organ, other organs including the liver, the spleen, the pancreas, the gall bladder or the adrenal glands, and nerves and blood vessels which ensure the nerve impulses and blood supply of all these organs. Original article published by Jean-François Pillou. Translated by Jean-François Pillou. Latest update on October 19, 2018 at 03:32 AM by ashpl. This document, titled "Abdomen - Definition," is available under the Creative Commons license. Any copy, reuse, or modification of the content should be sufficiently credited to CCM Health (health.ccm.net).